Racked La / Clever, James Franco-Approved Clothing Label, Clashist, Suddenly Closes. E! / Which Actress Had Ryan Gosling All Over Her Pants? E! / Editors' Obsessions: Benefit Liner, Ryan Gosling Leggings, Succulent Gardens & more! Women-launched fashion tech startups emerge in LA. 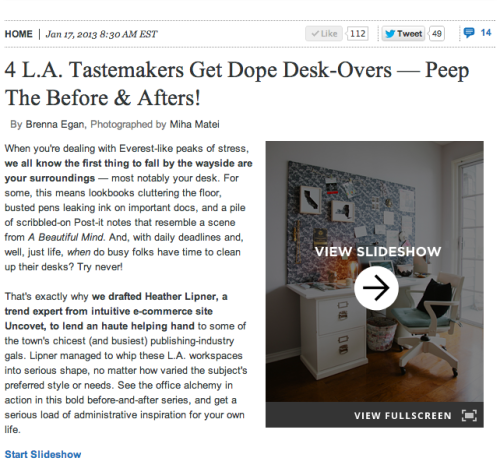 Refinery29 / 4 L.A. Tastemakers Get Dope Desk-Overs — Peep The Before & Afters!